Renowned as one of Vietnam’s most interesting and beautiful areas is the UNESCO World Heritage Site of Phong Nha-Ke Bang National Park. The area is known for its limestone karst scenery and caves, the most popular being the Phong Nha, Paradise, and Dark Caves. The rediscovery in 2009 of the world’s largest cave, Hang Son Doong has also peaked interest from intrepid explorers who can join multi-day expeditions with Oaxilis to reach it. 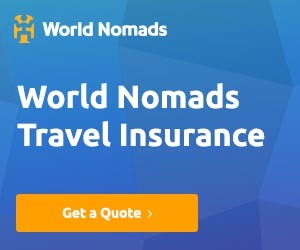 I badly wanted to do that, so was hugely disappointed to discover the $3,000 USD (£2,262 GBP) price tag per person, putting it out of reach for me and I expect many others. It was back to the drawing board to discover what else there was to do in Phong Nha other than the caves. I’d already decided to only visit Paradise Cave as the others sounded too touristy for me and were also expensive. Eager to get my trekking, wildlife, and nature fix I was excited when I stumbled across Hai’s Eco Tours website. 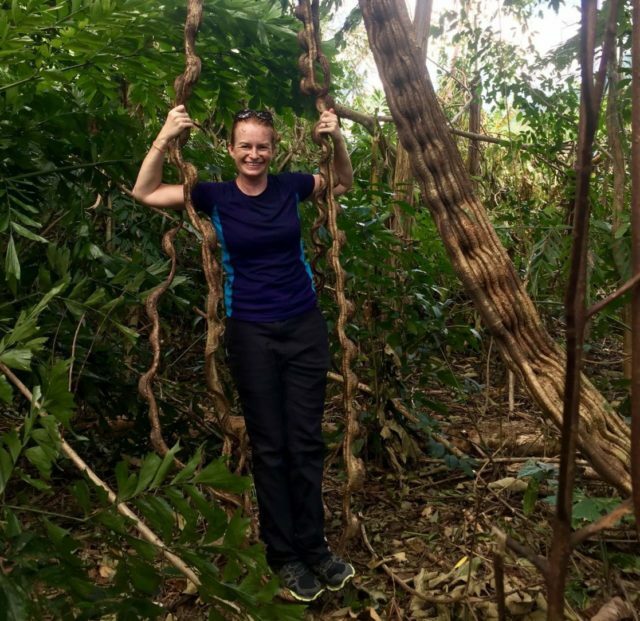 I wanted to do the two-day/ one-night Jungle Trek, Adventure, and Wildlife Tour but due to time constraints opted for the one-day Jungle Trek and Wildlife Tour. Hai’s Eco Tours provided me with a complimentary one-day tour which I’ve reviewed below. Read our full Product Review Disclosure here. Tourism in Phong Nha-Ke Bang National Park has increased since the discovery of the Son Doong Cave and since serving as a filming location for Kong: Skull Island. As a result conservation of nature and wildlife in the area has become an important issue. 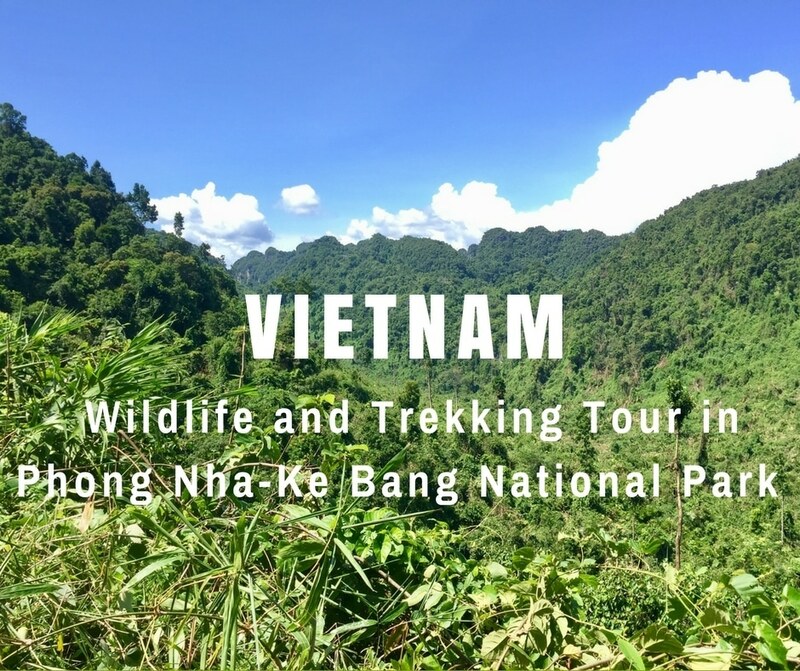 Local man Hai, passionate about nature and wildlife, has made it his mission to protect and conserve Phong Nha National Park and it’s plants and animals. He created Hai’s Eco Tours with the aim to educate local people and foreigners about the importance of protecting the environment around them. The tours encourage sustainable travel whilst providing employment for locals. Profits from help support the Phong Nha Wildlife Centre and locals, with some set aside for future projects. 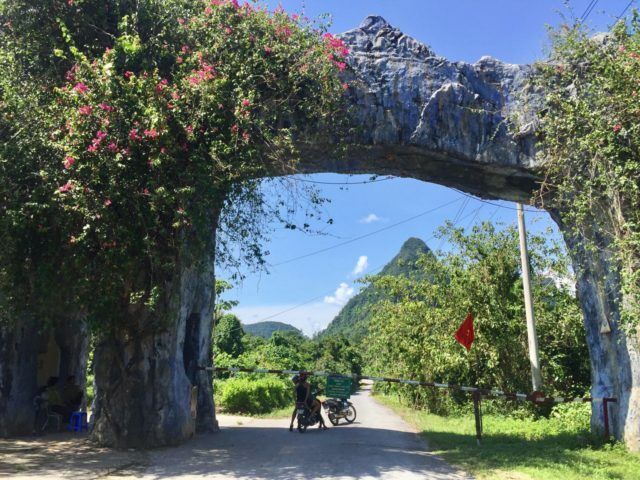 I arrived late into Phong Nha and as per helpful instructions received from Hai during previous email communications, I headed straight to Phong Nha Bamboo Cafe (also owned by Hai) to arrange my tour. They also serve delicious food so I was able to pacify my grumbling stomach with a beef stew for only 60,000 VND (£2 GBP) and a glass of Dalat white wine for 40,000 VND (£1.33 GBP). Once I’d eaten, one of Hai’s tour guides came to sit with me to book me on the trek for two days later and to run over all the details. I was picked up on the morning of the tour by moto at about 08:30 am from my farm stay by my guide ‘Trang’. I understand if you’re staying in town you meet your guide at the Bamboo Cafe. Trang drove me the short distance to Phong Nha Wildlife Rescue Centre. On arrival I met a Swiss couple who were to join me on the tour. We had a glass of tea whilst Trang gave us a detailed overview of the National Park, the Wildlife Rescue Centre, and its mission. The National Park is over 85,750 hectares and its flora and fauna has been affected by logging, poaching, and hunting by locals. These activities are often practiced not out of malice or greed, but because it’s the only way to feed their families and keep a roof over their heads. Recently new laws were passed against logging, poaching, and hunting; declared such activities illegal. This means many locals who relied on this for an income either continue illegally or turn to the dangerous, potentially lethal activity of finding and dismantling bombs left over from the war. They collect the dynamite inside to sell; which, of course, has the potential to end in disaster if it goes wrong as I’m sure you can imagine. Hai’s Eco Tours have given many locals alternative ways to support their families by creating legal, less dangerous jobs for them as moto-drivers, porters, and rangers. They have extensive experience and in-depth knowledge of the forest and jungle so are the best people for these positions. Some animals are rescued from snares or traps; or found as orphans when their parents are killed. Others are confiscated from business and people who have bought them from hunters to keep as pets or to use them for food or in traditional medicine. When animals arrive at the Wildlife Rescue Centre they’re checked over and any wounds treated, their background’s recorded, and they’re quarantined for a period of time dependent on the species. When the animals are healthy again and have re-learnt the natural instincts needed to survive, they’re (whenever possible) released back into the wild. 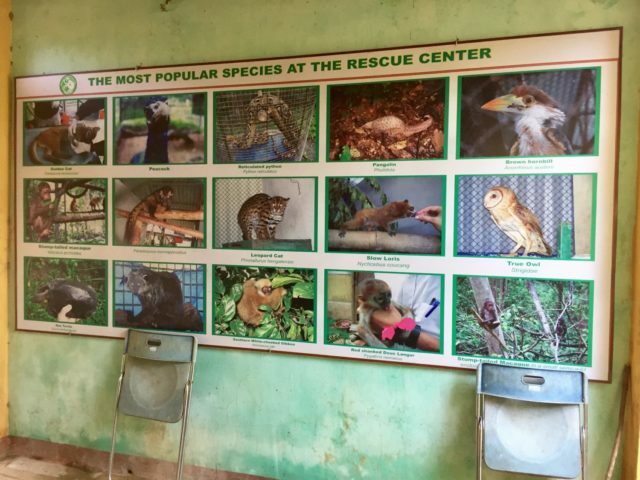 In the few instances where they’d be unlikely to survive in the wild, they remain in the Wildlife Rescue Centre or Semi-wild Enclosure at the Phong Nha Botanical Garden to be cared for and kept safe. After we’d digested the information Trang took us round the centre to meet the residents and hear their stories. Despite being in cages (a necessity during quarantine and rehabilitation), the animals were well fed and looked after. It was feeding time for the monkeys so we watched this before moving on to the civets, porcupines, peacocks, and a python. There was also a gibbon who was a long-term resident. A family had kept him as a pet for so long he could never go back into the wild. He appeared to be content though, partly due, I’m sure to his lovely big enclosure which had bought with funds raised by Hai’s Eco Tours and at Bamboo Cafe. Once we’d finished our tour of the Wildlife Rescue Centre we climbed on the back of motorcycles, me on Trang’s and the other two on the porters. I held on tight as we drove to Phong Nha Botanical Garden via windy roads surrounded by towering, jungle-covered limestone karsts. Despite the damage caused to the trees and vegetation by Typhoon Doksuri the views were still amazing. En-route we spotted the remains of small fires smouldering on roadsides as locals burnt debris left behind by Doksuri. Phong Nha Botanical Garden is not what you’d normally expect from a botanical garden. Instead of neat, manicured gardens, it’s a jungle of secondary forest made up of reintroduced native trees and plants. 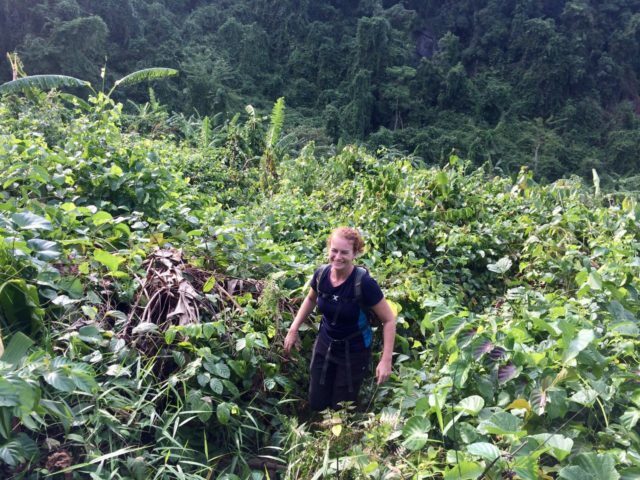 We began our trek in the botanical garden and followed a trail which wasn’t too challenging at first. The tree canopy offered shade from the sun so walking on the flat or downhill was quite pleasant. After a while, we emerged alongside the top of a waterfall which was in full flow following the typhoon rains. My heart sank a little as I realised we had to scramble down the side of the waterfall and ‘the fear’ took hold. I never used to get scared of doing things like that but I seem to be more accident prone nowadays. I’m not a fan of steps, slippery rocks, or anything else where I can envisage a slip, trip, or any other way of injuring myself. There was no other option though so I slowly clambered down the slippery rocks, using the strategically placed ropes to keep me upright. Getting down actually didn’t take long and soon we were sitting on the rocks at the base of the roaring waterfall. We rested a while before wading through a small section of river to continue the tricky scramble downwards. The others took off their shoes and socks and I changed into my walking sandals so we didn’t end up with wet feet for the rest of the day. We followed the trail down out of the botanical garden, into the proper jungle. ‘Vien’ one of the porters disappeared leaving us to trek with Trang and the other porter ‘Chau’. The vegetation became denser and fallen trees and branches blocked the trail in many places which Chau had to cut through. I soon realised walking sandals were not the best footwear as there were way too many trip hazards so stopped to change back into trail shoes. After a while, we paused at the bottom of another small waterfall and the Swiss couple went for a swim. I decided against it because it looked too cold and I couldn’t be bothered to change. Instead, I perched on a rock with my feet in the water whilst little fish nibbled at my feet. A free natural (and much more hygienic) ‘Doctor Fish’ fish foot spa in the middle of the jungle! After a short break at the second waterfall, we set off again. The typhoon had made even more of a mess of this part of the trail. It was pretty challenging, although not exactly strenuous. It was just tricky and required lots of concentration to ensure we didn’t trip and fall. 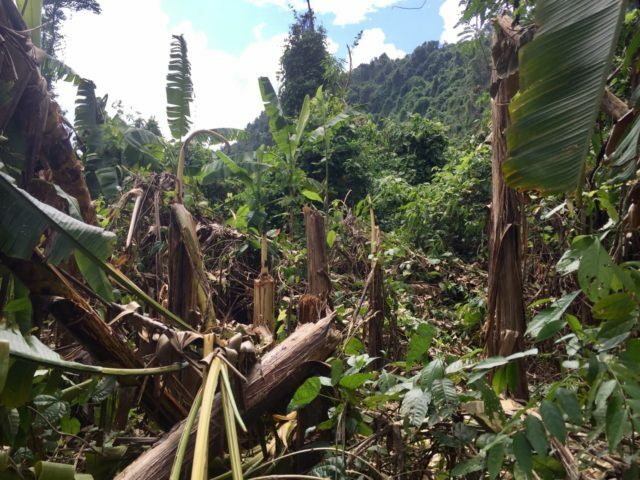 We stopped in the middle of ‘Banana Valley‘ except Banana Valley was no more as the typhoon had flattened it. Some twisted vines we discovered made a great swing and Chau showed us how to make a snare like those used by poachers. Before treks in this area could begin it had been necessary to clear many snares to make it safe for trekkers and of course, to remove the risk to wildlife. Trang explained we were trying to follow a ‘Secret Route‘ used by soldiers during the war. The trail however, was impassable in many places and I soon became convinced that Chau was hacking us an new route with his machete. At the time he didn’t admit this, nor did Trang, but they both seemed to have confidence in the direction they were leading us. 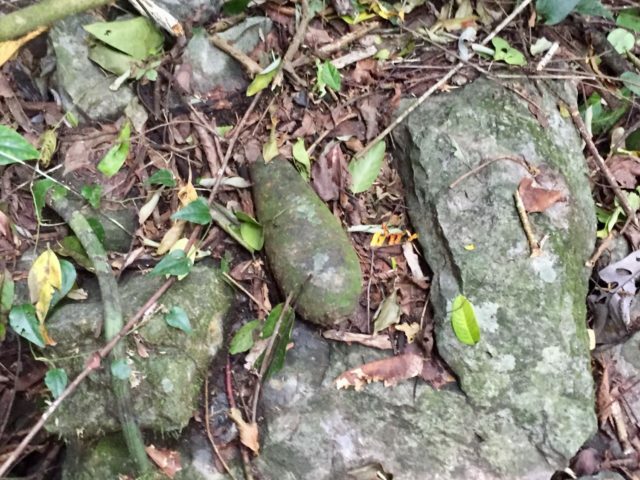 As we moved forwards Trang pointed out the occasional bomb crater, bombshell, or bullet casing. This made me wonder if we were still intercepting some of the ‘Secret Route’ after all. 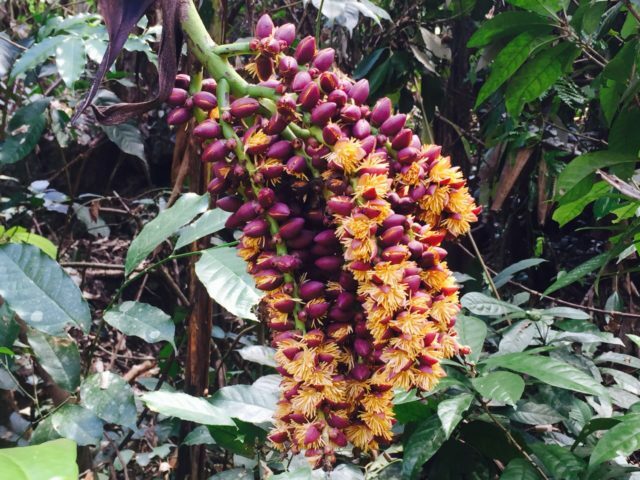 As we fought our way through the jungle we spotted a variety of flora and fauna. We spotted weird insects and lizards, beautiful butterflies, vicious biting red ants, and strange flowers and fruit. It amused us that whenever we asked what a fruit was that Trang wasn’t sure of she’d laugh and answer “it’s jungle fruit”. At about 12:45 pm we got a waft of delicious smelling barbeque meat. Minutes later we emerged into a clearing and found a smiling Vien waiting for us. 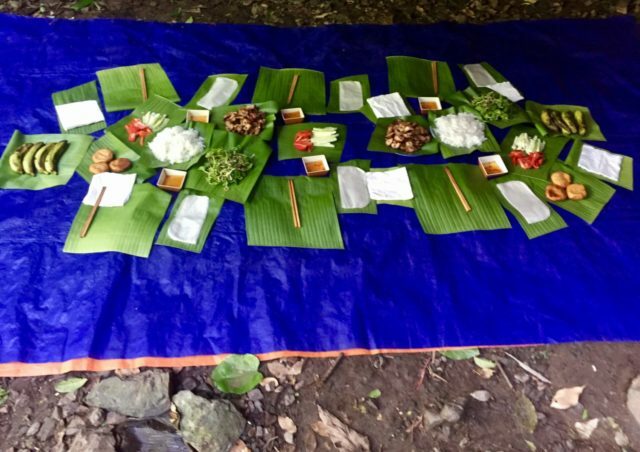 There was a fantastic spread of food laid out for us on a blue tarpaulin under a rocky ledge (the ‘Weapon Cave‘). A second tarpaulin stretched out from it to form a shelter. So this was where Vien had vanished to, he’d gone to prepare our lunch. There was barbeque pork alongside several side dishes of tomatoes, cucumber, bean sprouts, herbs, and noodles. There was also a sauce made from fish sauce, garlic, and chilli. We combined all these together and wrapped them in water softened rice paper to create the biggest and best fresh spring rolls I’ve ever had. Dessert was Vietnamese doughnuts made (I think) from rice flour and beans, and bananas followed by coffee. I liked the way we all ate together: us, Trang, and the porters. On many tours I’ve been on in the past, the staff except for the guide, ate separately and had food of a mediocre quality and smaller quantity. I’ve always found this quite uncomfortable so dining together made a refreshing and enjoyable change. I wish more tour agencies took this approach. Lunch finished, it was time to start the trek out of the jungle and back to the botanical garden. It involved a much steeper climb than I expected, in fact, it was about a 40-minute relentless climb. With the searing heat and fallen branches and trees to duck under or climb over it was hard work. When I reached the halfway point of the climb, I became a little unnerved due to the drop next to me. I pictured myself making a wrong move and plummeting to the valley floor. Trang was soon able to put me at ease and we successfully made it to the top. Throughout the ascent, Trang ensured we stopped for frequent water and rest breaks. Despite taking it slow, by the time we reached the top our lungs were bursting and we were drenched in sweat. I’m not going to lie, it was tough and I generally consider myself quite fit and can walk 30 km or more in a day with no problems. All the effort was worthwhile though, as once we’d caught our breath and looked around, the views were spectacular. We had several more obstacles to contend with during the last hour of the trek. By the time we made it to a lovely small, natural swimming pool in the botanical garden we were more than ready for a rest. The funniest part of the day came when we’d descended halfway to the pool. Trang turned to us laughing and whispered, “shall we shout out to them”? We looked in the direction she pointed and saw a frisky couple getting jiggy with it in the pool. Unphased, Trang loudly called out “hello!” causing the couple to go bright red and to jump apart as if they’d been scalded. It was hilarious and we all burst out laughing, I’m sure the couple wished the ground would open up and swallow them! We were all shattered at this point and whilst none of us joined the randy couple for a swim we did rest with our feet in the water, before walking the last relatively easy 45 minutes back to the entrance of the botanical garden. 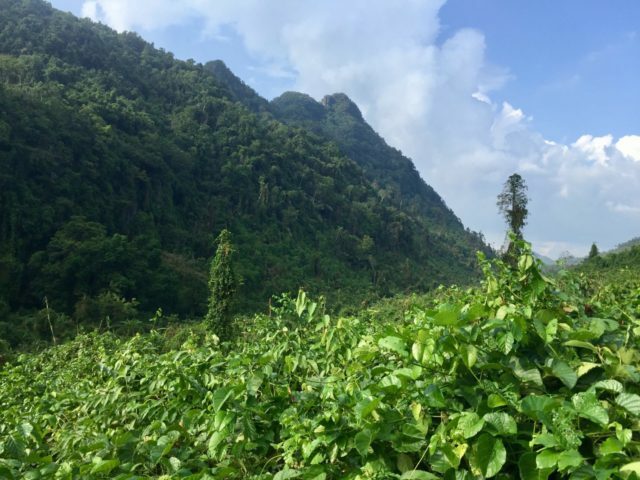 On the way out of Phong Nha Botanical Garden, we walked via the Semi-wild Enclosure where several porcupines and monkeys were living for the final part of their rehabilitation and transition back into the wild. 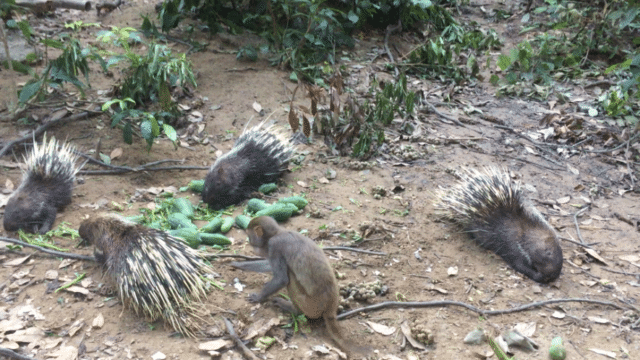 We spent an entertaining 15 minutes watching as the monkeys tried to steal food from the porcupines who shook their quills violently at them as a warning. Those cheeky monkeys clearly didn’t feel threatened though and continued to steal scraps of food. I’m sure more than one monkey must have ended up with quill related injuries that day! So What Route Did We Take? Before we left the botanical garden Trang, Chau, and Vien stopped in front of a big map, pointing at it and laughing. Trang explained they were trying to work out which route we’d taken, it seemed my hunch had been correct. Due to the typhoon damage they’d had to take us on several detours and weren’t 100% sure which way we’d gone. It didn’t matter though as the porters had done an amazing job of finding the best route and had got us back in one piece. The day had turned into a unexpected off the beaten track adventure; my favourite type of day! The price of a tour with Hai’s Eco Tours differs depending on the number of days and the activities included. They offer trekking tours combined with either wildlife or caves, and also a cave kayaking tour. The one-day Jungle Trek and Wildlife tour I joined costs 1,450,000 VND (£48.20 GBP) per person. I was hosted for three nights in Phong Nha by Phong Nha Mountain House. Read our full Product Review Disclosure here. 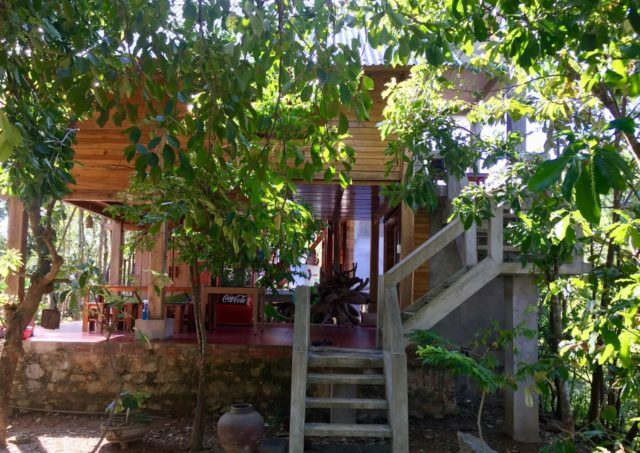 Located a short way from the centre of Phong Nha town amongst farmland and local houses is Phong Nha Mountain House. It’s a recently built family farm stay, run by the owner Ho An, with his sister Ai, who offer three rooms. 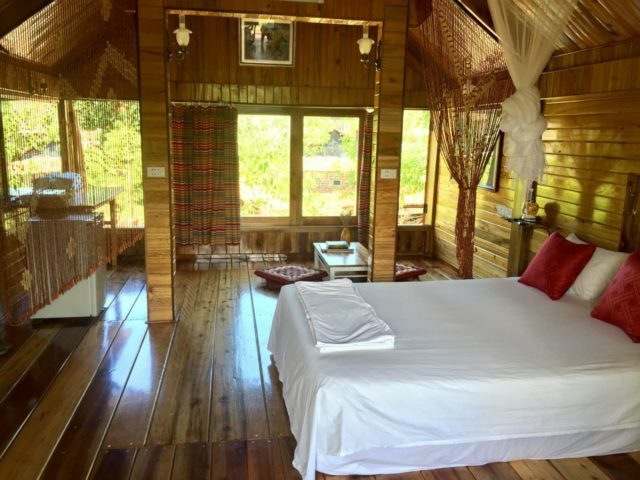 There’s a traditional wooden house on stilts with a private downstairs bathroom at $50 USD (£37.74 GBP) for four people or $40 USD (£30.20 GBP) for two people. Additionally, there are two Mountain Houses – double rooms with en-suite bathrooms also for $40 USD. The day before I arrived I received an email from Ms Ai to tell me that they had no power due to the typhoon and that it may be out for a few more days. She kindly offered me the chance to reschedule my stay but I decided to stay anyway. I just arrived prepared with a head torch, spare batteries, candles, and a lighter. Ms Ai sent her brother to collect me from Bamboo Cafe by moto. As expected the farm stay was in darkness, but Ms Ai’s brother quickly showed me to my room. He pointed out where the private external shower room and toilet was, gave me a lantern, and took my breakfast order. The air-conditioning and fans weren’t working but that was no problem as I used the mosquito net and opened the windows to get a breeze. Next morning I was at last able to see my room and surroundings in day-light, it was even better than I’d expected. I was lucky enough to stay in the gorgeous, traditional wooden house on stilts. It was beautifully set out and spotlessly clean, with a big comfortable double bed and a mosquito net. There was also air-conditioning, a floor seating area with a low table and mats, mini-bar, wifi, and even a hairdryer. Three sides of the house had glass windows offering a variety of views and there was a small balcony with table and stools. The private external bathroom was below my room and was clean, with a hot water shower; it was more than adequate for me. Each morning my delicious pre-ordered breakfast (included in the room rate) was served on my balcony. The first morning I had vegetable and egg noodle soup with bananas; the second morning was pancakes with fresh fruit; both accompanied with strong Vietnamese coffee. The breakfast view from the balcony was of the mountains, duck pond, and farmyard area. I met Ms Ai on my second day and she, along with her brother did everything they could to ensure I was comfortable and happy despite the power cut. He took me by moto to visit Paradise Cave by moto, and she arranged my onward travel by bus. I was also able to borrow a bicycle to get into town for dinner. Normally an evening meal is available at the farm stay but the power cut meant this wasn’t possible. If my breakfasts are anything to go by though I can imagine dinner would be just as tasty. 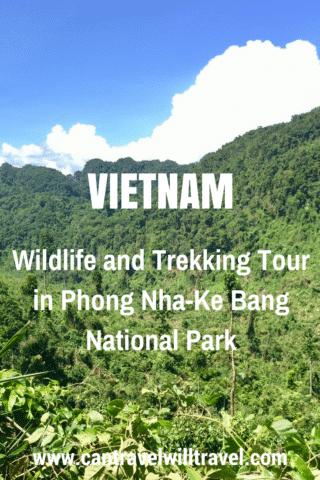 The one-day Jungle Trek and Wildlife Tour (and I’m sure the two-day tour) is a fantastic way to learn about Phong Nha-Ke Bang National Park and what is being done in the background to protect it. 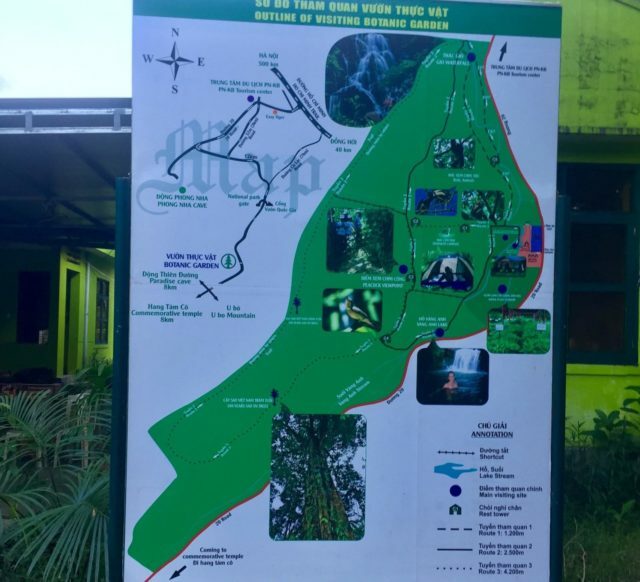 The trek should be about 8 km to 10 km out of the secondary forest of the botanical gardens into the proper jungle, and on into the primary forest. Be under no illusions though, the trek itself wasn’t easy. If you undertake it in the aftermath of adverse weather conditions be prepared for tough going and a greater distance if new trails need to be cut. Despite this, you can be confident of a well organised, enjoyable, safe tour with great English speaking guides and knowledgeable porters. If you love wildlife, nature, and trekking and are reasonably fit then a trekking tour with Hai’s Eco Tours could be perfect for you. It definitely ticked all my boxes. 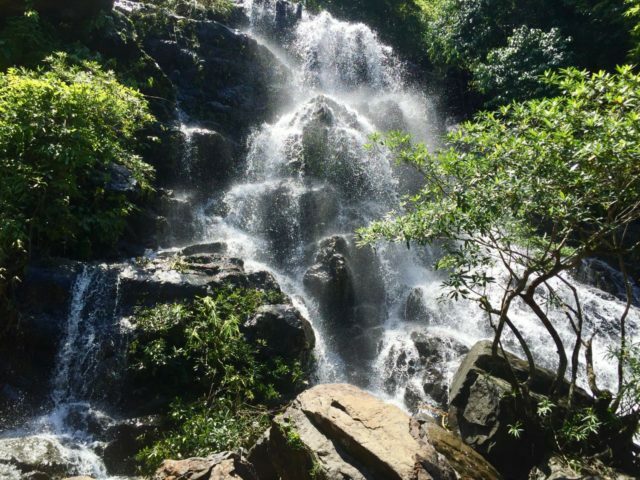 Have you been trekking or on an eco-tour of any description in Phong Nha-Ke Bang National Park? We’d love to hear how it went? 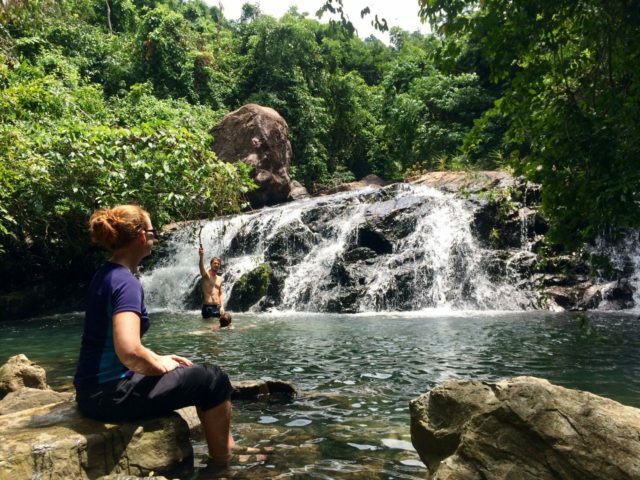 Product Review Disclosure: Hai’s Eco Tours provided me with a complimentary one-day Jungle Trekking and Wildlife Tour and Phong Nha Mountain house provided me with a complimentary three-night stay. This did not influence my post in any way and as always I’ve provided a balanced and honest review.